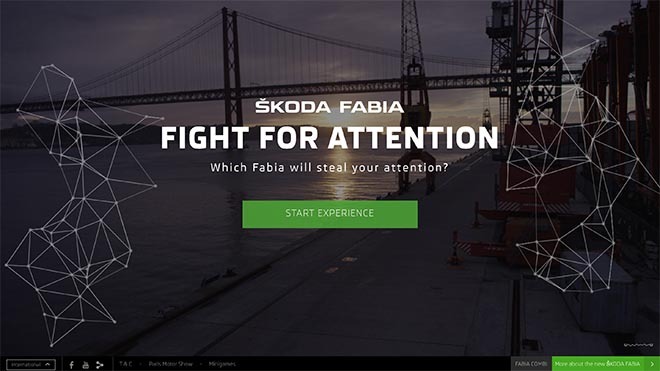 The film is part of the Skoda Fabia Attention Stealing campaign which includes an interactive site, fightforattention.com. The user experience starts with the calibration of the users pupil movement with the computer’s webcam. A 90” split-screen film follows, featuring two Fabias racing through a number of locations, fighting for the user’s attention. At the end of the race, the eye-tracking allows the site to calculate which Fabia stole most attention during the race, work out what they saw and missed, then create a personalised infographics of the eye movement and unique viewing statistics. Users can share all of this to their social media channels and have the option to book a test drive with a local dealer and sign up for notifications about phase B. In Phase B, users will be able to create their own films using a built-in editing platform. They can then submit their films to fight for attention against the ŠKODA drivers. By sharing these battles to social media, they invite friends to take part and increase their chances of topping the leader board by stealing more attention than their country competitors. 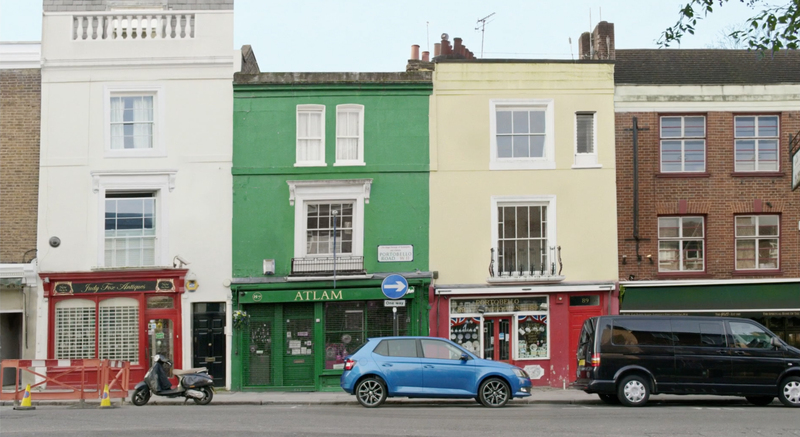 The Skoda Fabia Attention Test ad was developed at AIS London by executive creative director Geoff Gower, art director Jay Packham, copywriter Ian Cochran, project manager Andrew Thorne. Filming was shot by director Luke Bellis via Minds Eye Media with producer Ben Sullivan, director of photography Dan Stafford-Clark, production manager Carmen Siu, 1st AD Jonathan Sidwell, 2nd AC Harry Wheeler, gaffer Stefan Mitchell, DIT Nelson Oliver, art director Hayley Macdonald and art assistant Ruth Pickard. Post production was done at Tundra by head of post Espen Haslene. The Fight For Attention project was developed at 18 Feet & Rising, London, by creative director Anna Carpen, creatives Behrad Taherparvar and Oli O’Neill, business lead Andrew Barnard, agency producers Greg Hemes, Carl Ellis-Coward and Brendan Marriott. FIlming was shot by director/editor David Chvatal via Zoomfilms Production with producer David Propper, director of photography Sebastian Milaszewski. Post production and grade was done at UPP. Sound was produced at Sound Square. Music was produced by Roland Moor. Animation sequence was produced by story board director FX Pourre aka UFO, designer Fred Venet, Flash animators Ruben Sellem and Fred Venet, 3D artist/compositor FX Pourre, compositor Clement Germain. Animation post was done at Mathematic.tv with coordinator Rebecca Rice. Interactive site technology was produced at B-Reel.